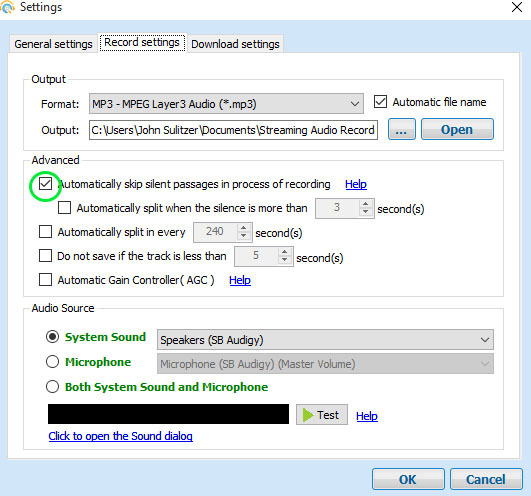 Windows Software to constantly record the last X minutes of audio entering the microphone? I'm looking for a Windows Software that would constantly record in the background the last X minutes (e.g. 30 minutes) of audio being inputted into the microphone whenever my PC is on, much like a Cockpit Voice Recorder. I often times brainstorm ideas or writings out loud, so this would be very useful to be able to immediately go back to something I just said and hear the exact way I said it without having to remember to push "record". Does any such program exist? whenever my PC is on: not implemented yet. You would need to add the application to the Autostart folder for the moment. no integrated playback. Just saving as WAV is possible at the moment. no support for MP3 due to licensing issues. Disclaimer: I am the author of this tool and I have written it just for this software request, because I think it's a cool idea and I could use it myself. Go to Settings > Record Settings > in the advanced put a check on "Automatically skip silent passages in the process of recording"
Seems that RecordPad could fit, althought not free. The most important feature: "Record only when you are speaking with voice activated recording". See also the "Record Settings", from its detailed features page with screenshots: the program allows you to set a "maximum recording time", and choose what the program has to do once this limit is hit: stop or start recording a new file, which seems convenient for you. The "Transmit" and "Output" settings may be of help for you too, since you can configure what to do automatically for each recording once is done (sending to FTP, mirror to a folder or execute an external tool -say for cleaning your oldest files?-, and also you automatically set a new file name pattern (sequence number and others, so you could always easily find your 'last' or even older records). I think it's a pretty flexible solution if no other software matches exactly your desire. Claim to work on Windows 10, XP, Vista, 7, 8 and 8.1, and there are also versions for Mac, Android & iPhone. Not the answer you're looking for? 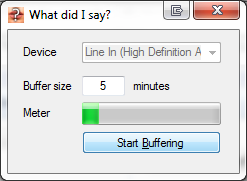 Browse other questions tagged windows-7 audio automation voice-recording or ask your own question. A standalone software, or plugin to clean up audio.